For those who haven't visited Libjo for more than 5 years, this is one change you will notice when you're back here. 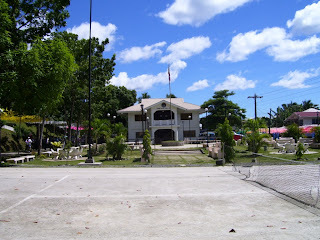 The area where once the old municipal stage, open basketball court and rural health center stand was now renovated and a lawn tennis court, park and Legislative Building can be found. 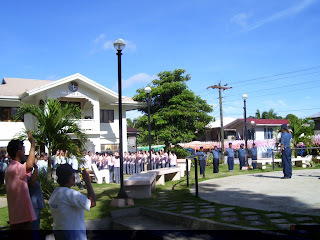 It is where Flag Raising and Flag Retreat ceremonies are being conducted. You can click the photos to have a closer look. wow, 5 years. how i missed albor. Why it took them too long to implement the project? The drawing has been complete since 1995!!! I still remember that we have a good brain storming with Boy Jacquez and Euclid, and eventually it was brought to the SB. I thought it was implemented a year after I left Libjo and that was 12 years ago!!! How about the reclamation project/extension of Brgy Albor? is it complete? Rex,it sounds like you still have grudge about this project..
when you implement a project rex there is what we call "TIMING". 12 years is enough to let the people involve forget the how much it cost so getting kickbacks is not obvious. KURAKOT is the word. as i know, what the people of the poblacion needed is a good supply of drinking water. they are aware of that but they again will wait for another 5 years for another GOOD TIMING. people,always remember that libjo is part of the Phil. islands. As far as i know, dugay jud ang project, bisan sa leyte ka pa or manila ba . We are not in australia or singapore or europe perhaps. bisan diri sa california naa ang red tape.Always remember, pilipinas ang nasud nato. ayaw palabi ug lupad kay sakit kung mahulog... salamat. ******Always remember, pilipinas ang nasud nato. ayaw palabi ug lupad kay sakit kung mahulog... salamat. I always remember I am a Filipino and strive to be Filipino and for that till now I didn't change my citizenship. I appreciate that the project was implemented but I just wonder why it took soooooooooo long to do it. ******ayaw palabi ug lupad kay sakit kung mahulog... salamat. If I fell, the only place for me is Philippines since I AM A FILIPINO and not a Citizen of any other country, so dili sakit kay wala man ko makalupad. *****as i know, what the people of the poblacion needed is a good supply of drinking water. they are aware of that but they again will wait for another 5 years for another GOOD TIMING. Well, the design of the waterworks in Albor when I was there considering the constraints (financially) is good only for 12 years provided that the population won't change. Its high time now to upgrade the system. ******Rex,it sounds like you still have grudge about this project..
Well,the project was proposed with the MUNICIPAL PLANNING OFFICER and not with the SB. Maybe that was the missing piece of the puzzle. The brainstorming includes to maximise the usage. Not like the multi purpose buildings proposed and built before nga BALHINAN RA UG KANDING KONG MOOYAN!!! Wow! What a nice exchange of comments in here. This is what we called the triumph of truth, hatred towards people who discover the truth and love of our very own LIBJO. I appreciate you guys for starting this kind of conversation with your hearfelt expressions. I also salute Mr. Rex Malbacias for sharing your intriguing comments in our town's improvement. You knew all of this plans before hand since you've worked as the municipal Engineer and i appreciate the way you expressed yourself. Rex, i would let you know that i am one of those Libjoanons who is very proud for the huge improvement of our town and i'm sure that most Libjoanons feel the same way too. We have the most advanced Gymnasium in the whole Dinagat island and people from neighbouring towns were admiring our beloved town. It was very disappointing to me that you are the only one here whom i knew that was criticizing all of these development that we have in our own town. Rex, i knew what happened why you left your office being the Municipal Engineer in Libjo. And let me re-phrase that, it was not an act of resignation due to some career move but i think it was a wise move to get yourself out from those big shots. Why bother yourself working away from your family when you can earn a good living in your hometown? I think everyone can answer that for me. Rex, if you still have the fire burning inside, i think this is not the place for you because you will hurt a lot of our fellow Libjoanons here. Don't take your personal emotions float against the welfare of our town and its people. You might have the reason for complaining but your comments are not good at all. Mabuhay ang tanan taga Libjo! hahahaha....dili libre ang serbisyo I agree with you pero dili sab panghatag sa way mapaabot ang tax nato tanan.I doubt you're paying tax mao nga iresponsable ka ra nga magpasagad. hehehe..and that is not an attitude of a GOOD CITIZEN let alone afraid to put their names below of what they wrote being anonymous shows nothing but irresponsibility. Pangutana lang sab... are you responsible enough to post your name? ********Rex, i would let you know that i am one of those Libjoanons who is very proud for the huge improvement of our town and i'm sure that most Libjoanons feel the same way too. We have the most advanced Gymnasium in the whole Dinagat island and people from neighbouring towns were admiring our beloved town. It was very disappointing to me that you are the only one here whom i knew that was criticizing all of these development that we have in our own town. I have been to places or countries. The reason why countries like Singapore, UK, Malaysia and even Thailand has progressed is because there are people who always ask question and sometimes critizise (constructively as I do.) If no one will do it then there is no room for improvement anymore. Try not to be content of the small improvement try to think more!!! ******Why bother yourself working away from your family when you can earn a good living in your hometown? I am here employed in Australia as a Tunnel Project Engineer, which earn much much much more of what I earned then.My career has advanced far more than anybody expects (Member- Phil Institute of Civil Engineers, British Tunnelling society, Australasian Tunnelling Society,American Society of Civil Engineers, American Concrete Institute) to name a few. My point is, why the progress is so slow? *******Don't take your personal emotions float against the welfare of our town and its people. You might have the reason for complaining but your comments are not good at all. As I told you guys, no grudges and hatred. I expect Libjo to grow more!!! 1. a clan were able to declare swamps for their use. they got DECLARATION from the assessors office even though you can't do it if it is underwater. they cut the mangroves in the KAMANG area and converted it to a fishpond. just a disguise. 2. they got declarations for a vast land in PARAGUA area. it's too long to explain why it's illegal but what i know is that there's a case in court now to void that declaration. 3. a family now owned the property which used to be a government building. now they have it leased by the only bank in LIBJO. 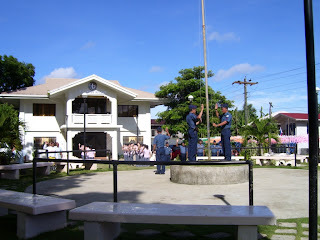 It's still fresh in my memories that flagpole in front of the building. 4. maybe the same clan who was planning to get the former stockpile of VELORE MINING near the LIBJO wharf. thanks to a vigilant non-lumad councilor, the clan did not succeed. 5. if you're a member of the clan, you can be hired as municipal engineer even if your not a Libjoanon. MR ADMINISTRATOR I HOPE YOU WILL POST THIS COMMENT SO PEOPLE WILL KNOW. TO MR ANONYMOUS, DON'T BE PROUD THAT YOUR CLAN PAID MORE TAXES WHEN IN EXCHANGE YOU GOT MOST PRIVILEGES. *****yes!!! i am responsible enough to post my name but I WONT because i have the value of humility and caring. i know you know me and my clan. regarding taxes -- my clan and myself give more. much more than you and your clan combined. WHERE IS THE HUMILITY HERE? ******Can you believe that? Cebu City being known as a tourist spot have no internet access at all? ******and that you being an engineer, you thought you are above everybody else here? that you SUPPOSEDLY KNOW MORE than the township officials? TOWN OFFICIALS ARE SERVANT OF THE COMMUNITY. THEY ARE PAID LIKE YOU. WHO IS GREATER NOW THE PEOPLE WHO SERVES OR THE PEOPLE BEING SERVED? ******speaking for myself, THERE ARE SERVICES THAT I DID FOR FREE FOR THE PEOPLE OF LIBJO. that, i can stand up for -- the truth. THERE YOU ARE!!!! ANOTHER HUMILITY FACTOR ADVERTISED!!! ******yes!!! i am responsible enough to post my name but I WONT because i have the value of humility and caring. In a way the conversation goes; we can fully determine what kinds of people are sharing their thoughts. I do appreciate Anonymous 1:42pm and/or MC FOX360 for their optimism that our beloved town will improve more. My fellow Libjo-anon, I salute! Not like the other guy there which finds himself comfortable bragging (to talk with excessive pride about an achievement or possession). Fellow Libjo-anon, better ignore such kind of comments and don’t be provoked…, as the bible says...... Do not answer a fool according to his folly, or you will be like him yourself. Answer a fool according to his folly, or he will be wise in his own eyes. (Proverbs 26:4-5). We are not kids anymore to believe what he said “no grudges at all” for the truth is opposite and it is evident in his comments. We can help our town grow more or improve in any simple means we can, and not by merely doing any criticism. We can offer suggestions and provide support & encouragement to our Municipal Officials so that they will continue or improve their services. We don’t need Albert Einstein or any other people of similar capacity, or any other International Engineer which is the best in his own eyes, for more development of our hometown. We need people having dedicated hearts and open minded that are aggressive enough to bring progress and welfare of our beloved town- Libjo. Mabuhay kitang mga Libjo-anon! LIBJOANONS: TINUOD ANG ALBOR NI-IMPROVE TUNGOD SA "DAKO NGA GYM", AND INTERNET (WHICH IS OWNED BY A PRIVATE INDIVIDUAL) ANYWAY. SO PROGRESS BY THE ELECTED OFFICIAL IS JUST THAT, "THE GYM", AND THATS GOOD. BUT WAIT A MINUTE, WHAT ABOUT ANG TUBIG? I THINK ALMOST 2 YRS. AGO NAKABATI KO NGA NAA NAY 1 MILLION NGA BUDGET PARA SA TUBIG IF NOT NOT MORE, SO ASA NA MAN ANG KUWARTA PARA SA TUBIG KARON? KAHIBAWO BA TA, KITA NGA WA NAG PUJO SA ALBOR KARON NGA GRABE KA LISOD SA TUBIG? AND THAT IS ONE OF THE MOST IMPORTANT NEED SA TAWO. PANGUTAN-ON NATO ANG ATO MGA NAMUNUAN SA LUNGSOD? POSTED BY A LIBJOANON LIVING OUTSIDE LIBJO. i agree with your comment where's the water which is one of the top most needs of all human!!!!! let's talk ideas and opinions here not people. an intellectual one so we will know if our beloved LIBJO is really improving. don't let emotions dictate our sharing of what we think & what we believe. there's always be two sides in every issue. one may agree, the other thinks the opposite. and if we are wrong just take it as constructive criticism or whatever. don't attack individuals for it's not a wise thing to do especially if it's done by cowards who don't put names on their comments. now, how do we gauge improvements? who contributed to the improvements? can the mun. gov't take credits to improvements done by private individuals? are there projects not very visible but very important to the people? the incumbent leadership has been in power since the early years of the cory administration. 20 years ago. (at one term the spouse set as mayor). now start counting the progress in our town if there's enough or more than enough accomplishments in 20 years. we all know that DepEd still has fundings from the national govt. brgy high sch. during there creation was funded by the legisture authored by our congresswoman. so lets not talk about it. 1. hospital - our hospital is still unfinished. it's been like that for many years now. 2. gym - we have one of the best in the province (if not the only best). 3. water supply - very poor. 4. health center - funded by a foreign donor. 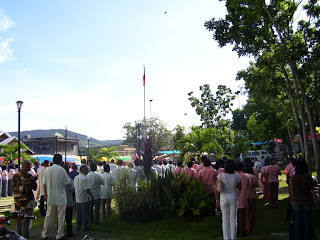 5. legislative building and plaza - a good improvement. 6. internet cafe - owned by private individuals. government has no business in it. 7. families now enjoy longer electricity supply - dielco. 8. road to brgy. quezon - a very good project. but try to look back years ago. they already reported the road as finished. double financing. a very poor planning resulting to loss of money. 9. concreting of road to the hospital - a very necessary one but money was wasted when the "canal" collapse during construction because of poor engineering judgment. 10. cable tv - not a govt. project. 11. a resort called pig-ot - privately owned. 12. ihawan - a ghost project. 13. kamang reclamation - a good idea. 14. tourist center - good for beautification. does it benifits the people? 15. businesses growing - maybe because of better roads we have now that connect to other towns in the province. a national govt project. 16. coles farm - private. fellow LIBJOANONS try to continue adding the list and think. IS IT ENOUGH OR MORE THAN ENOUGH ACCOMPLISHMENT IN TWO DECADES? if you're pro-admin, be proud if improvements are satisfactory and accept also if it's not. if you're not aligned to the present admin. be happy if they did good but don't be silent if you know they're doing less TO HAVE CHECK AND BALANCE. THAT'S THE ESSENCE OF DEMOCRACY! MY APOLOGIES TO NOT PUTTING MY NAME THIS TIME BECAUSE MOST OF YOU KNOW ME. I'M TRYING TO BE NEUTRAL. I'M POSTING THIS COMMENT IN A FAIR WAY AS WHAT I THINK IT IS. JUST WANT TO SUGGEST HOW TO MEASURE IMPROVEMENTS THE RIGHT WAY. I MIGHT BE WRONG WITH MY SUGGESTIONS. BUT I BELIEVED THAT YOU CAN ONLY MAKE A GOOD CONCLUSION IF EXAMINE THE ISSUE(S) CAREFULLY. hi mcfox..i'm just wonderin if you're sincere enough with what you are talkin..if you're true enough why can just show yourself rather hiding your identity so all the people will know you...who you are. I'm just a passerby of Libjo site and i was reading all the posted comments and i really appreciate to those people who are really sincere enough to post their names or represent their groups. I think the mean issue here is all politics the old rotten problem. There are 2 kinds o f people when it comes to politcs as the tagalog people says "MAY TAONG MANLOLOKO AT TAONG NAGPAPALOKO "
what a pity if you know what's the truth but you just let it slip away for your own benefits. It was mention that water is currently the major issue and also electricity "What a DISGRACE it is"....they are the most basic needs of human being... Is the community leader not doing anything? still waiting for TIMING????? is 12 years is short enough for the word TIMING???? ?...this needs should be given action immediately they are the topmost priority. Have a nice day and wish the moderator will post my comment. Thanks for the space...see yeah!! ******My fellow Libjo-anon, I salute! Not like the other guy there which finds himself comfortable bragging (to talk with excessive pride about an achievement or possession). Fellow Libjo-anon, better ignore such kind of comments and don’t be provoked…, as the bible says...... Do not answer a fool according to his folly, or you will be like him yourself. Answer a fool according to his folly, or he will be wise in his own eyes. (Proverbs 26:4-5). What motivates the writer to quote the Bible to call me a fool is because deep within him thats WHAT I AM, A FOOL!!! The Bible says Judge not that ye be not Judged!!! ( Matthew Chapter 7), Apostle Paul wrote that whoever call his brother a FOOL is liable.. but then again the writer is hiding behind the proverbs!!! he is not liable and he didn't judge me!!! so he/she can't be judged!! !He uses God's word as cover... WHAT A BLASPHEMY!!! MY ANSWER: I am here employed in Australia as a Tunnel Project Engineer, which earn much much much more of what I earned then.My career has advanced far more than anybody expects (Member- Phil Institute of Civil Engineers, British Tunnelling society, Australasian Tunnelling Society,American Society of Civil Engineers, American Concrete Institute) to name a few. My point is, why the progress is so slow? THIS IS A CLASSIC EXAMPLE OF A REACTION MOTIVATED BY ENVY!!!! Maybe if I am a failure this kind of people will say MAAJO RA!!!! *******9. concreting of road to the hospital - a very necessary one but money was wasted when the "canal" collapse during construction because of poor engineering judgment. ****10. cable tv - not a govt. project. Well, more questions to be ask!!!! i enjoying visiting LIBJO site ... and indeed, the town needs improvement. sometimes, though, with the beauty of your island, it would be better left untouch -- the nature and the waves are such a beauty to behold. true, drinking water and electricity are very important for the town to progress. is there a way to obtain it without relying too much on the government and having a lot of expenditure? maybe some goodhearted, industrious and knowledgeable engineer and crew, whether they be private or public can and would tap the island's natural resources -- like spring and ocean for water and of course, electricity. moreover, i would like to comment that mc fox360's opinions -- i believe the person is sincere and that her clan really is all for the town. there was no mention at all of the specific donations and/or services they gave, nor was it mentioned about their desire for any privileges and political pull or power. i opine that maybe, mc fox360 and clan have a lot of blessings and a generous enough to share it with their kababayans. this seem to be a pollyana opinion, but God knows what is the truth. for me, mc fox360 said it all. i live in LIBJO for many years when my parents still working there and now still have some contacts with family friends and i know for a fact that there is NO charity organization there ran by a clan. if your working for a government or other organization and got paid, your service is not free. if your an elected official, that's your duty. if you have businesses you have profits the reason you are taxed. THEN WHAT ARE THE FREE SERVICES? if you help your supporters it is because they're voting for your clan member during elections. THE ONLY FREE IS GOING TO CHURCHES & RECEIVED JESUS CHRIST AS YOUR PERSONAL SAVIOR AND STOP TELLING LIES. ******i would like to comment that mc fox360's opinions -- i believe the person is sincere and that her clan really is all for the town. there was no mention at all of the specific donations and/or services they gave, nor was it mentioned about their desire for any privileges and political pull or power. OR MAYBE ITS NOT TRUE SINCE THERE IS NO MENTION OF WHAT CLAN, WHO SHE/HE IS OR DOES MC REALLY EXISTS!!! The sharing of ideas here is getting a little bit deeper. It’s a good point to express our feelings, widen our visions, and enable us to know what is really happening in our beloved town. I’m sure that our purpose is to contribute and share little or big ideas for the welfare and improvement of our town. It maybe delivered in a disgusting or tactful way, but still we do have the same purpose. For us the readers and people who are active in posting comments, please analyze carefully and be responsible enough for the words and thoughts we shared. We must have to weigh the two sides of the coin so to speak. To Concerned Libjoanon, I appreciate the way you express yourself and all your exposé. Am sure lots of Libjoanons are not aware of those things, and I must have to accept, I’m not fully aware of those thigs also,maybe because of time and distance reasons. In order to arrive a brighter future, we must have to consider the past, right? There are people who might get hurt but if that’s the reality, then you will have to accept it. Now, what step(s) are we going to take in order to correct those corrupt acts? At least we know the truth if it is the truth; the issue if it is only an issue, or is it possible to have some proof? I appreciate much also the way Anonymous 8:51AM gave us some hints on how to weigh the -what we called improvements. You really have the capacity in sharing your vision in intellectual and tactful way. Though sometimes we need to be rough like Rex did, to pinch the concerned people who are blind and deaf so that they will feel that some if not all are aware and much concerned what is happening around. To the Municipal officials especially those who are concerned, do you think 20 years is not enough to give Libjoanon abundant water? Please let us know that you are also doing your part. To Rex, a quote is a quote and a saying is a saying, and it is being used as an opinion seems as yours and not a judgment. Please analyze it carefully into the deepest and not only word for word or phrase for phrase. It is applicable to all and not only to selected personalities. One perfect example; if you consider(not judge) the writer behind that proverbs as a blasphemous or fool or whatever, I ask the opinion(not judgment) of all the readers, is it quite okay to throw him back with Matthew 7? Why, are all the comments here being absorbed as judgments? We have no capacity to judge anyone, am sure we know that. As I said, we are only sharing opinions and considerations, not judgement. As a Libjo-anon, let me repeat, our aim is for the welfare and improvement of our beloved town. Though our opinions and considerations are delivered in different ways coz everybody is unique, but still our goal is the same. We need not to fight with each other in order to achieve improvement. Please correct me if I’m wrong and my apologies to those who are offended with this comment…. To the person or people who created this site, I salute! Needless to say what are the benefits of this…..
Oy! Pahabol tood Mr. Administrator, what I mean, needless to say what are the benefits our fellow Libjoanons specially those in faraway places have, because of this site… Words are not enough to express our gratitude…. It's getting hot in here!!! Let me bring you out once again the matches that started this fire of comments. This is the story posted by ENGR. REX MALBACIAS that started all of this overwhelming reactions from humble LIBJOANONS. I could not blame you Rex for quistioning the prolonged development of what has been planned during the time that you were still the municipal engineer in Libjo. And i think that is normal being one of the player of the team working for the project. My question is, why is it that you are so damn in critisizing all things against our local government? I've been visiting LibjoLIVE for a long time and this is not the first time that i read your horrible comments being a Libjoanon. I remember you posted a comment regarding the old gym that was repaired by reinforcing metal columns and even emphasizing yourself regarding your accomplishment as an engineer. I appreciate the way you reacted on these issues and your comments might be good enough to resolve those hidden anomalies within our local government. But it's very clear that there is something inside that you wanted to scream out. Is it because you did not win the game the time that you were still in the office as the municipal engineer? Is it because you left your position due to anomalies that was coming along the way and now you wanted to hit them back? You are not required to answer all of my question Rex because i know what's happening and its very obvious from your unpleasant comments. I know you are a great Engineer and i'm so proud being my fellow Libjoanon. But i will til you this, you showed arrogance for what you have and who you are to people who are so humble that didn't say anything against the welfare of our beloved town and its governance. Your comments are not sweet to decent, great and humble people of Libjo who's dream is to live their life at its best within their hometown. Once again, let's all stand and be proud being LIBJOANONS. 1.Why it took them too long to implement the project? The drawing has been complete since 1995!!! 2.I thought it was implemented a year after I left Libjo and that was 12 years ago!!! How about the reclamation project/extension of Brgy Albor? is it complete? 3.Rex,you said no grudge at all? but that was 12 years ago.pero sa mga kumentaryo nga imong gi posted,dumot kaajo kaw..pangutana lang ni..daghan kaba nahimo sa atoa lugar? kung ikaw man gani ang "engineer or architect" ba,libre ba ang imo serbisyo? 4. Why bother yourself working away from your family when you can earn a good living in your hometown? 2.But i will til you this, you showed arrogance for what you have and who you are to people who are so humble that didn't say anything against the welfare of our beloved town and its governance. 1.Not like the multi purpose buildings proposed and built before nga BALHINAN RA UG KANDING KONG MOOYAN!!! THIS IS A FAIR AND NEUTRAL! 2. It was very disappointing to me that you are the only one here whom i knew that was criticizing all of these development that we have in our own town. 2. Rex,it sounds like you still have grudge about this project..
3. people,always remember that libjo is part of the Phil. islands. As far as i know, dugay jud ang project, bisan sa leyte ka pa or manila ba . We are not in australia or singapore or europe perhaps. bisan diri sa california naa ang red tape.Always remember, pilipinas ang nasud nato. ayaw palabi ug lupad kay sakit kung mahulog... salamat. DHENZ IT SEEMS TO ME THAT YOU DON'T KNOW WHAT IS QUESTION, WHAT IS CRITICISM, WHAT IS ACCUSATION, WHAT IS COMMENT etc.. AND WHY ARE YOU HIDING BEHIND THE BACK OF MR. ANONYMOUS? a picture of the team will be posted na. i saw 28 comments on one post. i was the one who posted the first comment-."missed". special to me. i cant forget the good memories we had in albor. we dont have to be told abuot respect, nakuha nato na sa church. you were one of our leaders in our sunday school before, remember? your blessings. dont use it to destroy others. why dont you suggest? in that way makatabang ta,libjoanon man kaja ta. lastly,try to reflect first.. regards to yo your family. so you may know who am i.
your comments about libjo didnt bother me at all. critisms, accusations, judgments or suggestions. everyboby,bisan dili tulog, that includes me...think first. in the phil, according to UN. we drink. bathe and wash with mineral water. davawenyos are very proud of it. im wondering why bottled water are still being sold here? the water system is not like ours. patience people, im sure they are not sleeping.. I don't feel any pleasure at all but people tend to tweak what I mean in those questions...IS IT BECAUSE I AM THE ONE WHO ASK QUESTIONS? no problem with asking questions, giving comments or even critisms. much better kung suggestions coz there are issues in which mas nakabalo ka than them. advices and suggestions are very much welcome.. just direct your comments to the persons concern...im sure they will consider. Yup! I aggree with gibs... it's far better to have suggestions rather comments that lead to misdirections... Also, lets not be too personal.. If we have the capacity or whatever, lets help libjo in any means we can! Ako pa ninjo, maghiusa! cgurado pa nga mas muasenso ang Libjo kung magtinabangay. Ipost ni palihug Mr Nico. Aron pod makaapil ug suggest ang pure nga mga bisaya ba! Daghang Salamat! kinsa nag ingon nga dili magkahiusa ang libjo? dili na maingon kung wala magkahiusa. dili parehas sa uban nga lungsod nga pusilon ka kung dili ka nila ganahan. sa libjo, pwede ka mag komentaryo. maajong adlaw sa tanan. Bitaw! For your info....nagkahiusa ang ta Libjo oi.... Hinuon, naay medyo ginagmay nga argumento pero normal ra na... Anha mahibaw-an nga naa tay freedom to express ourselves di ba? Ug anha sab mahibaw-an nga makamao ta mo rason..
Unsa may ako saya nimo Jig nga bagan tag initan man gajod nimo ako ngayan? I did not even post a single comment on this topic. It seems like you are accusing me for all of those comments which I really don’t know. I never asked you a question, I did not accuse you for something, who am I to judge you? It is God who is always there to guide me and my family and I will never use him just to; as what you said “justify your argument”. I hope you are professional enough in dealing with your emotion whatever it is in any situation that is open to the public. I just want to remind you that whatever is written here is not limited for Libjoanons only and I’m sure you know that. So stop accusing me for what was happening here, OK? As what you’re telling me to be responsible, I think it is my big responsibility to clear up my name in public for people who are discourteous in using my name offensively without my consent. I hope you will find yourself accountable for your own mistake and learned from it. Be smart and wise before you pay the price. i know it's been a problem and mun. officials are aware of it. because we are only humans we make mistakes. the officials have good intentions of giving the people enough water but they made a mistake of awarding the project to "bugos" contractors. if i'm going to blame people, i'll start blaming libjoanons nga miunay ug ilad sa mga tawo ug mga opisyal sa lungsod. if you recall this group of people built a concrete tank near the new hospital. PERO WA MAGAMIT KAY DELIKADO UG MALIGID. it's a work of non-competent people. MAAYO LANG UNTA UG WA TO SILA MABAYRI. UG NABAYRAN POD UNTA GIKIHA ARON MA-RECOVER ANG KWARTA. puwede nga masayop ko pero mao siguro nga lisod marepair this time ang supply sa tubig kay diha namay kwarta nga nagawas adtong una pero palpak. kaila ang mga libjoanon ani nila. UG GUSTO TA MOTABANG SA ATONG LUNGSOD ATO SAD NI SILA ISUMBONG SA MGA OPISYAL O SA ATO MAYOR ARON DILI NA NI SILA KAUSAB UG PANGILAD. mc if you want to visit Libjo you are assured that poeple are very hospitable. promise you are safe in our town and you will enjoy your stay. but MC, there are issues in our town that is hard for outsiders to comment with facts. even me as a Libjoanon don't really know the whole picture on the issues discussed. as i see the previous comment has some words misspelled but it's clear the person did not blame people the way they vote. he blames people not helping the libjoanons and their offials. it seems your good in spelling but not in reading comprehension. no offense please. as an outsider you have NO knowledge how the towns "mother nature changes". as population grows, consumption also increases. we have wild fruits we love to eat before that the young children now is not enjoying anymore like the "puyangi, putian, pinuon" etc. i'm not going to touch critical issues here. i'm just trying to give you a little bit of background how like any other places changed in the course of time. if you noticed, a lot of people in the "chat area" are very happy because of the "squid". for many years we are abundant of this but local fishermen know it's getting scarce for the last few years. i disagree with you comparing our ancestors time to the present which suggest that what they had before is still present today. NO! the vast forest that we had is no longer there. because of developments, big portion of the mangrooves were gone. and because of inruders from neighboring places the biggest cave is no longer as attractive as before. NATIONAL ECONOMY also affected our small town. we had the best hospital in the island before but seems not anymore this time. our professionals prefer to work to other places for OF COURSE GREENER PASTURE AND BRIGHT FUTURE financially and professionally. we have nurses now in diff. places in the world, medical practitioners, engineers, IT professionals and others who wished they have stayed and work in our town. they are now singing "I LEFT MY HEART IN LIBJO" not San Francisco. because of that even though they are in Europe, Mid-East, and in other places in the world, they STILL LOVE TO USE OUR DIALECT. sorry if you don't like it but as a saying goes "WHEN IN ROME, BE A ROMAN. we love our town and if there are people who know better about our town are the Libjoanons themselves. BUT DON'T WORRY MC PEOPLE CAN UNDERSTAND THE NATIONAL LANGUAGE "FILIPINO" AND ENGLISH TOO. WHEN YOU GO THERE YOU STILL CAN TALK TO THE PEOPLE AND REST ASSURED THEY WILL UNDERSTAND YOU. PLEASE NO OFFENSE, WE MAY DISAGREE ON ISSUES BUT It DOESN'T MEAN THE LIBJOANONS ARE "masungit". You are very much welcome in our TOWN. as you said you're from Harvard and majored in print media. there's no reason we have different perspectives with regard to "nature and technology". one simple example is that the people in libjo are very, very, very happy now with the continuous supply of electricity. that's technology! well i did not graduate in Harvard but i have my masters degree in engineering at MIT also in MA, USA and have better edge discussing nature and technology than a print media major. don't worry i'm not in Libjo this time. hammer is an alias and for me giving initials only also comparable to an alias since thousands of people have the same initial as you are. i choosed hammer coz i'm a fan of MC HAMMER during the ICE ICE BABY time. gib, I sent an e mail to you before I left Australia last week asking question as you told me. I know I got the correct address coz it doesn't come back to me. IS YOUR SILENCE MEANS YES? *****no problem with asking questions, giving comments or even critisms. much better kung suggestions coz there are issues in which mas nakabalo ka than them. advices and suggestions are very much welcome. 1. I suggest that the problems mentioned is to be solved not tomorrow but NOW!!! I suggest that an engineering team will be sent to assess and find another water source and if there is none, I suggest that the engineering team will upgrade the existing system. If they don't know, I suggest to send the gathered data to those who know how to do it they can even send it to me and THIS TIME MY SERVICES IS FREE!!! 2. I suggest that the people tasked for the improvement of the municipality will THINK MORE (they are paid to do the job) on how the municipality generate income (for a start) and not encourage to beg from the national government!!! Cable TV is a lost cause now but its not too late!!! 3. I suggest that the municipal officials will listen to suggestions!!! More suggestions? I WILL LEAVE IT TO THE PEOPLE OF LIBJO..
point well taken taken rex. ajaw lamang kasuko!!! ok sana ang mga comments nyo ... kaso hini fair kc may nagtatago ..wag nyo gamitin ang anonymous pakilala naman kayo oh nakakapagod manghula noh ?? totoo, nagtatago sila kay anonymous, ikaw rin!!! rex tell the truth that's why he post his name!!!!! rex telling the truth and his sure what he post about that's why his real full name published..
thanks for this site, all the comments and arguments are great but for you people who are fighting to depend your self or clan or whatever it is, is just plain stupid, just move on, if you want help our town, just make suggestion or organize this people who participate in this conversation to make an outside voice for change, gather all your unique ideas an be an advocate for change and improvement of our town. It's so nice to see our town again, (although we're halfway around the world). It just brings back childhood memories. This is such a great website, by the way (I must say). They did an incredible job (whoever put it together). Very easy to navigate, the vivid colors, it's full of information, the archives, the favorites, the blogs...and... the photos! (the icing on the cake)...ooohhh! can't wait to go on vacation there again! I'm gonna be a frequent visitor here. mmmm .. . very nice changes , , , after all how i miss to to be there again!! !